Brochures are as important as business cards; the only difference is that a business card represents an individual while a brochure represents an entire company. Brochures usually incorporate a range of products or are used as another way to sell your services to potential customers. It is an important marketing tool, necessary for many kinds of businesses, as it influences customers and clients through the visual presentation of the products and services you offer. The graphic design used in the brochure is more likely to be remembered therefore, mentioned below are a few simple and essential tricks useful in designing a powerful winning brochure. • Its content should be brief. Make use of different graphics and pictures to create a great design. Make sure that the company logo is added to the brochure. Check your picture database before using any picture, as there may be copyright issues. Select a reputable design team to design the brochure. • Usually designers will be working on Mac computers. The design work should be done in Adobe Illustrator, Quark, Freehand or Photoshop. • You can choose different folding options, like the popular bifold and trifold brochures. Most people prefer trifold brochures to many other alternatives as they fit in a standard #10 envelope, and this will save you on postage. • It is always better to go with full color brochures. The options you have when you design in full color allow good designers to play with the logo, graphics, pictures, etc. therefore create a much better and attractive design. • Make sure that the content used in the brochure is free from copyright issues. It should communicate the fundamentals of the business effectively. Ensure that the company logo is highlighted. Also, maintain a consistency in use of shapes, colors and sizes. Review the brochure before finalizing and approving the design to print. • Highlight all the important elements in a brochure. Messages such as “CALL NOW” should be printed in Bold or Italics, or both. Make use of provocative statements, wherever possible. Use bright colors to decorate the outlines and borders. • Use reader-friendly fonts. If you use plenty of text stick to serif fonts, like Times New Roman. These are easier to read. • Use a high quality photo database and graphics whenever required. Adobe Illustrator has a default collection of pictures and clipart as well, but avoid using these as they may have been seen before. 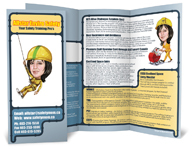 An impressive brochure certainly attracts a customer to the product and your business. Visit various Internet sites providing clipart and photo databases, and if you find something unique use it in the brochure’s design. Many picture database websites offer affordable images, clipart, icons and pictures.